Featherspring orthotics end foot pain • Luxis International, Inc. Foot pain? Forget it. It’s gone. Guaranteed. End sore aching feet caused by: • Corns • Calluses • Bunions • Flat feet • Pain in the balls of the feet • Burning nerve endings • Cramping • Painful ankles • Hammertoes • Heel spurs • Plantar fasciitis PLUS so much more! 1 Year Trial Period … yes, you can return them if they’re not perfect! Regular $329.95 – Today $229.95 … and, yes, that’s a risk-free, refundable payment! Featherspring Orthotics are Guaranteed to End Foot Pain – Or Your Money Back! Most foot pain comes from misalignment of the bones in your feet. Foot pain begins when your foot’s balance and natural elasticity is gone. Corns, calluses, bunions and even hammertoes can develop. Ankle, leg, knee, hip – even lower back pain – can result from improper foot alignment. And when your feet hurt, you hurt all over. That’s why you need Featherspring® Orthotics! Like most other people, you probably thought nothing of long walks or standing on your feet for hours. And were you wearing sensible shoes? Probably not, most of us don’t. Now your feet are paying the price of years of wear and tear. Do any of these conditions sound familiar? Corns and calluses – (one of the most common foot problems) A thickening of the skin, often caused by pressure or irritation due to the way a person walks or to ill-fitting shoes. 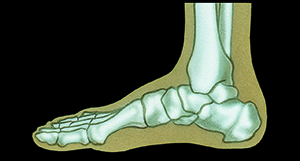 Bunions – A hard, bony lump inside the foot next to the big toe. They are most common for women who wear shoes with narrow toes, little to no support, or high heels. Pes planus (flat feet) – (relatively common) The arch flattens out when walking, causing the foot to roll inward so it can support your weight. The cause is sometimes congenital, but can also result from repetitive walking or standing on a hard surface over a long period of time, pregnancy, and obesity. 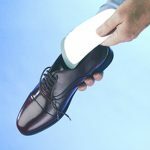 Heel pain and heel spurs – A painful condition that occurs when the plantar fascia becomes inflamed due to repetitive pressure when walking without enough protection or when the arch of the foot is not properly supported. Aching feet – not a technical term, but nonetheless a very real condition for millions of people. Not to worry … the news is good. Please keep reading. Now! No More Foot Pain. Guaranteed! Featherspring® Foot Supports, a remarkable discovery from Europe, are unlike anything you’ve ever tried. First, they are custom-formed for your feet and your feet only! 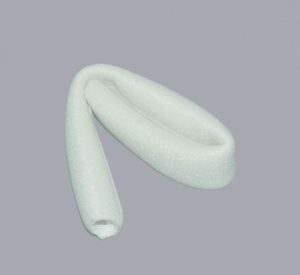 Secondly, flexible Feathersprings help restore and maintain the elastic support you had when you were younger. Furthermore, you can stand all day, walk, dance, jog or even run in total comfort. Your feet, ankles, legs, knees, hips – even your back – can find relief. You see, Feathersprings actually support your feet. And they do so while absorbing shock and relieving pain. And because they’re made with flexible stainless steel, they move and flex with your foot the way your foot was meant to move. Feathersprings feature a unique three-point suspension. (See the picture showing the bottom of a Featherspring.) Your feet are supported from your heels to your toes. The 3-point suspension cushions your foot against the pain and damage caused by walking and standing on hard surfaces. 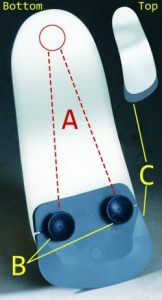 Metatarsal cushions – small, round, rubber shock absorbers soften all those jolts and pressures. The Featherspring® orthotic is the only foot support with built-in, adjustable shock-absorbers. We scientifically select the right amount of support for your foot. 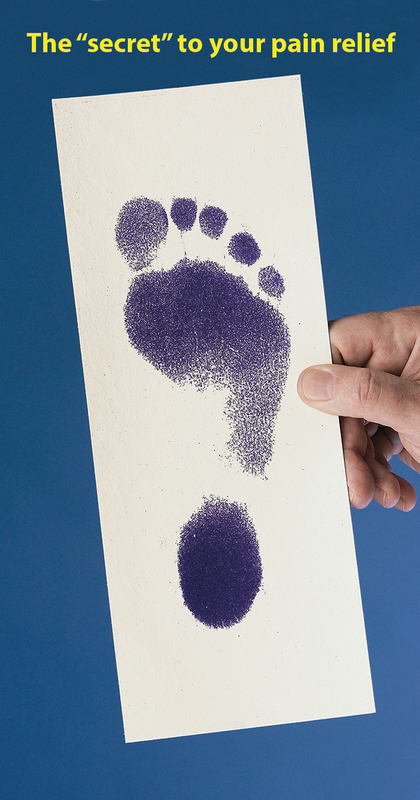 So, why choose a custom orthotic? Yes, you could settle for off-the-shelf store inserts. But are these right for you? Store-bought supports are bulk-produced, to give minimal support to the maximum number of people. A few standard designs are meant to fit everyone. That means those store bought supports may be partially right for you and partially wrong – even possibly giving you the wrong support for your feet! The “secret” to your pain relief … the best foot impression to best reveal what your feet need! There’s no guessing what you need with Feathersprings. 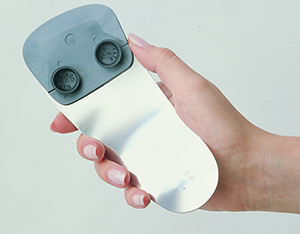 Feathersprings are custom-made from impressions of your feet. (Not to worry … there are no squishy boxes or gooey stuff to step on.) 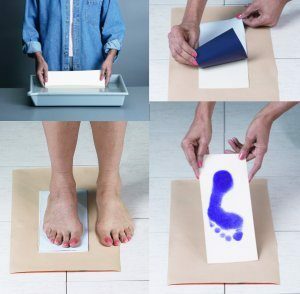 Making impressions of your feet is quick and easy. We send you a kit with specially made cold-pressed, porous impression board plus matching carbon paper. You simply dampen the impression board, stand on it with the carbon paper and you’re done. Your foot impressions show us the width and length of the foot, arch height and weight-bearing pressure points. It’s the best process we know of for accurately revealing what your feet need. As a matter of fact, it’s the same process that has been used for over 45 years and the first step in making happy Featherspring owners. For over 45 years, Feathersprings have brought blessed relief to more than 3,000,000 foot pain sufferers worldwide. No other foot support has ever given so much relief to so many people. It doesn’t matter whether you are a woman or man, whether your feet are size 4 or 14, what width your foot is, how low or high your arches are, how old you are or how long you’ve had foot pain… we know Feathersprings will work for you. How long does it take to get my Feathersprings? We’ll mail you the BIG PINK ENVELOPE with impression materials. Inside you’ll find the specialty impression board and carbon paper. You get the impression board wet, line up the carbon paper, stand naturally on the impression board and that’s it! Your impression should look similar to the image shown here. Mail your foot impressions back to us (it’s postage-free within the United States) and we’ll get to work on your Feathersprings! Believe it: soon you’ll really walk pain-free! It doesn’t have to hurt when you walk. There IS a solution and it’s wonderfully simple – Feathersprings. You don’t have to go to lots of stores trying lots of products; you don’t need to spend hundreds of dollars for plastic supports. 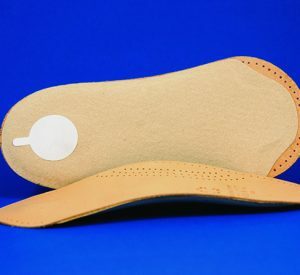 Instead, in a few minutes, from the comfort of your home you can order a premium, lightweight, flexible foot support that’s hand made expressly for you. SAVE hundreds when you order from home. Professional custom foot supports are expensive (typically $400 – $600) and are not as high of quality as Feathersprings. AND often you don’t even get a warranty or trial period. We are so sure you’ll love your new Feathersprings and will want to keep them that we even include a full one-year trial period. That’s right, you’ll have one full year to try your Feathersprings in all your shoes and everywhere you go. If you’re not certain they’re right for you, just return them and we’ll send you a full refund of the purchase price. PLUS, Feathersprings include a Lifetime Guarantee. (Read more about it under Product Data tab.) If your Feathersprings should ever break from normal use, and parts have been maintained, then we will make new Feathersprings® for you free of charge. much more comfortable with my Feathersprings I was injured over 4 years ago when a big 20 ton truck ran a stop sign at a high rate of speed. My ligaments and tendons broke down in my feet and ankles and my knees have been out of line 3 years and more. I've been in Rehab much of 3 years now. I feel strength and much more comfortable with my new Feathersprings. I'm looking for total healing. I'd never want to give them up. They're great They are really doing me good. When I'm working I can notice a big difference when I don't have them in my shoes. They're great! It's like heaven! I'm so impressed! I never believed they would work! It's like heaven! I can walk, jog whatever! THANK YOU! Thanks, Featherspring. I can stand without tiring now, and at the end of the day I still feel good. The orthotics really work! I can walk and stand without pain! I am so satisfied. I am not hurting when I walk. My feet are not sore, I can walk or stand without pain in my back, leg or foot. This was the best thing I could have done. It has been a long time since my feet have felt this good. Thank you kindly. Feathersprings saved his career. Just wanted to let you know how pleased we are with the Feathersprings! Gar's feet are improving and he says you saved his career. Feathersprings are all that you claimed. One of the best investments I've made. If I neglected to say thank you at the time I purchased the supports, I apologize. But please know that I feel it was one of the best investments I've ever made and have recommended them to all who will listen. I'm a believer. Your supports have relieved my foot pain. I can walk and stand without suffering. I am now a believer in your product. I feel like there are springs under my feet. I put the Feathersprings in my shoes and wore them the first day. They feel great and are comfortable! I feel like there are springs under my feet. Wonderful product. No more limping around. I received my Feathersprings and I am delighted that I can walk pain-free after years of limping around. Thanks for making it possible to enjoy my daily walks again. Better than my nurse's shoes! I had a pair of Feathersprings at least 15 years ago. After a death in the family and a flood, I put my house back together but in the process I put away my Feathersprings and could not find them. A daughter, who worked in a medical supply store, got me a pair of nurse's shoes which gave me some relief from a hammer toe and fallen arches. I decided I need a new pair of Feathersprings so I ordered the material to make a new impression. Behold! I found the original pair two weeks ago and have been wearing them ever since! I am so thankful for the relief I am receiving. Thank you again for a pair of feet that are more comfortable! They help me save money. I received my Feathersprings and I love them. I don't have to wear supports under my toes to keep them from digging into the insoles of my shoes. They will save money by not having to purchase those heavy orthopedic shoes. Relief from my foot troubles I put them in my shoes the first day I got them and haven't taken them out since. I wish everyone that has foot trouble could experience the relief I have from Featherspring Foot Supports. A Corrections Office on my feet everyday I would just like to say the Featherspring shoe inserts purchased is money well spent. Being a Corrections Officer and on my feet everyday my feet feel 100% different now. Thank you very much. The arch supports are working for me. My legs don't hurt. I can walk without the weakness and pain I have been having. Just a short note to tell you that I have been wearing the Feathersprings for a couple of months and it only took three days and my feet felt better already. It's the best thing I have gotten for my sore feet. They are not all pain are yet, but I can walk a lot better and way less pain. Thank you – Thank you! The Feathersprings fit fine and I sure felt the difference in a couple days. Now I wear them all the time. No problem with callouses or burning sensation Just want to tell you how pleased I am with my Feathersprings. I have been wearing the Feathersprings for several months and now have no problem at all with callouses or burning sensation – and I truly feel like I am walking on springs. I thank you very much. Thank you very much. Without my Feathersprings, I couldn't walk. No more corn or bunion pain. I have no more corn or bunion pain. You will put Dr. Scholl's out of business! Thank you for giving relief to so many people! I have been wearing your product since 1987 and am quite satisfied with the comfort I receive. Once again, many thank to you all. I am well satisfied with them thus far. I am well pleased with my Feathersprings. Thank you for your wonderful product, shoe inserts. I have neck and back pain. The pain has improved a lot wearing the inserts daily. Excellent! Thank you again. I have been wearing my Feathersprings almost two weeks. They have been so much help to my feet and legs. I can walk and stand on my feet longer. Thank God I have found something to help! My Featherspring inserts are worth their weight in gold. Relief from the very first day! Thank you, Thank you very much! You are truly a God send person. I was prepared for the "initial torture" of wearing new inserts (foot supports) but it never happened. From the very first day I got so much foot relief that I was able to wear them the whole day and now I won't go without them. I can walk and even run when I take my dog out! Your Feathersprings are as good as your brochure claimed! When I received my Feathersprings, I read the directions and then put one in my right shoe and marveled at how comfortable it was. The left foot was not as comfortable at first, but within a week was as good as the right foot. After another week I put them in my dress pumps and could not believe how much more comfortable these shoes were. I could wear them all day. I also use them in my winter boots (here in Wisconsin we get a lot of snow) and I can walk -even run - so comfortably when I take the dog for his twice daily walk. Thank you so much for making such an excellent helpful product that really does live up to your advertisement. Thank you so much for easing my pain. We are pleased with the results Roy is getting from the Featherspring arch supports. walked over 2 miles - no pain! Feathersprings are sure great – just in use over two weeks. I walked down town and back over 2 miles return, no pain in feet. Not bad for 84 years old! They help my back and feet. I like them very much. The Feathersprings help my back and feet very much. I am very pleased with them. I was skeptical about ordering them. But with the guidance of my Podiatrist and all of the help of your company, I am now thankful I have them. Again, I will say thank you for all of your help. the pain has completely disappeared Your foot supports are wonderful. I have had painful heel spurs and have had trouble walking. But since wearing Featherspring foot supports the pain has completely disappeared -- it's like I never had heel spurs. Thank you. My feet feel better than they have for years. I am very pleased with my Feathersprings. I never realized they would make such a difference. My feet feel better than they have for years. They are so lite and cushiony. I feel really good about the steel. Thanks. I must write and tell you that seeing is believing. Just in three days my hammer toe is staying in place without bandage or toecap. I put the Feathersprings in my shoes and wore them all day. They were a little uncomfortable at first but now I wear them all of the time even with different shoes. The Feathersprings are a God send. My feet are very comfortable. Thanks again. My mobility and balance are both improved. My mobility is so much improved that I am now doing volunteer work daily. I needed a quad cane to be mobile at all. (I kept falling all over the place.) After many tests, I was diagnosed with Multiple Sclerosis. My balance is markedly improved. I was trying to resign myself to a life with horribly painful feet, no balance to speak of AND the cane. You have improved that so much for me and I am so very grateful. Thanks a lot. I am on my feet at least 12 hours a day as an RN in the Emergency Room. The Feathersprings have helped a lot. Thanks to Feathersprings my feet and my legs do not ache anymore. My swelling has all but disappeared. I really appreciate your product. Thank you. I have found my Feathersprings to be helpful and I wear them all the time. Thank you. My feet are much better. Had I not gotten these arch supports when I did, I'd be in a wheelchair today. Feathersprings relieved the severe discomfort of my patient. I am MDG Jr, M.D. and doctor to Mr. H from Las Vegas. I want to let you know that the foot supports that Mr. H. recently purchased from you gave him relief in 28 days of the severe discomfort he was having in his heels and feet. This allowed him to increase his gait, stance, and feel more comfortable walking. He is most pleased, and given that Mr. H. is more than 95 years old, I think even myself, personally, this is a testimony to the product, and I have to admit that I may very well want to try this product myself. I thought I'd have to spend my life in pain. I've had my Feathersprings for almost two years now and they are beyond amazing. I have severely flat feet and experienced terrible pain for years until I started using your product and now I can spend all day on my feet and not feel even a bit of pain. I've seen foot doctors and therapists when I was younger and was convinced that I would have to spend the rest of my life in pain. The first time I wore the Featherspring inserts I was able to walk pain-free, as if I never had a foot problem to begin with. Your product has not only lived up to my expectations, it has surpassed them. I can't rave enough about my Feathersprings but I do want to say thank you for creating a product that wasn't designed solely with profit in mind. Thank you for thinking of people like me and caring enough to improve our lives forever. Many thanks for the miracle. It would be hard for me to tell you what a difference to my life your product has made. When I ordered the Feathersprings almost four years ago, my mobility was limited to the extent that I could walk only for about half an hour per day without excruciating pain, often lasting well into the night and preventing me from sleeping. One of the top five osteopaths in the US told me that any recovery would be uncertain and would take years and many operations. At that point I was pleading with him to amputate my feet, as I figured, I would at least have more mobility with artificial limbs anyway and probably less pain. I only responded to your advertisements because I got so irate at what I thought were the ludicrous claims you were making for Feathersprings. I figured that you were offering false hope to such as I and decided to settle it in my mind once and for all. I now work in the construction field where I am not only constantly on my feet buy carrying heavy material. I can go for walks with my children and play with them at soccer and other running games. I have just returned from a visit to my family in Europe where we walked every day along beaches, historical sites and through the countryside. In other words I can now function as a normal person when it comes to mobility. I have no reservations whatsoever in recommending them to anyone I hear complaining of aching feet. Everyone who knew me before I got them does not need to be told. Many thanks for the miracle. They instantly took away all my pain. Just a note of gratitude to your company for my new Featherspring Foot Supports! I only wish that I had the sense to order them many years ago when I first saw your advertisement for your product. Then I wouldn't have had pain in my feet for all those lost years. I put the Feathersprings into my shoes the next day after receiving them in the mail and they gave me instant relief from all of my pains. In fact, so much so, that I even forgot to remove them all day the first day and they instantly took away all of my pain since the first day I had them in my shoes. I heartily recommend your product to anyone who has or now is suffering pains in their feet and I always talk about Feathersprings to anyone who will listen to me. I know that some people may think that your price is too high like I did, but the cost is nothing compared to having feet that don't constantly pain when one is walking on misshapen feet like mine were. So, I wish you and your company the very best in the coming years. Thanks so much for your help. It's a pleasure doing business with you. I must tell you what a pleasure it is to deal with Luxis. All too frequently a company will renege on a guarantee. You however, were very courteous and prompt in replacing my orthotic that broke. In spite of the fact that I purchased it a long time ago, the transaction was handled in a very expeditious manner. You may be sure that I and my friends will continue doing business with you. I am now a believer. Prior to obtaining Feathersprsings, I had been reduced to walking only short distances without foot pain and leg fatigue. I have always been a cynic. I am now a believer. I am more than satisfied! I cannot say enough for Feathersprings. It has been over 9 years since I first purchased my pair and I wouldn't be caught without them. What a difference they have made to my physical well being. I was very skeptical at first when I responded to your ad but thought I had nothing to lose except the gnawing pain and discomfort I was experiencing in my feet and legs, and with your money-back guarantee I felt I had to give it a try. Am I ever glad that I did! Any day that I forget and go without my Featherspring inserts I soon pay the price. I am more than a satisfied customer. I am amazed and impressed by the back pain relief. Enclosed is my order for Featherspring supports for my wife, mainly because I am so delighted with mine. I waited a month to write, to be sure the improvement was real and not a placebo effect. I have had left lumbar back pain from intervertebral facet arthritis which has, at times, been disabling. When I put in Feathersprings my back pain was immediately relieved, and has been at most only 10% of its former severity for a month. I expected my feet to feel better, which they do, but I am amazed and impressed with the apparent change in my spine. Thank you for making this wonderful product available. I wish I'd gotten them sooner. I've enjoyed my supports. I only wished I had them before now. Truthfully I didn't believe they would do my feet any good because my feet hurt me so bad before. Now I am comfortable in my walking, standing and whatever I want to do. They have done wonders for me and I have recommended them to other people. I am back to walking 6 miles a day. It has been about 3 months since I received my adjusted Featherspring arch supports. I am so pleased with the results, I felt I had to write to you. It took several weeks to get used to them but compared to my old rigid plastic orthotics, the Feathersprings truly live up to the name. With the adjusted Feathersprings in place, I am now back to walking up to six miles a day in perfect comfort and ease with no pain or soreness afterwards. All I can say is thank you for restoring one of life's pleasures. My husband has decided to place an order for Feathersprings. Again, many thanks for getting my feet back on track. I bought a pair of Feathersprings and wouldn't be without them. My feet are not as tired. They have proven to be everything you have said they would be. I was having pain in my right heel, I guess it is a heel spur. 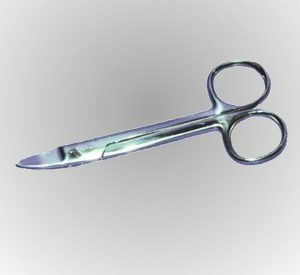 Since using the inserts the pain has just about disappeared. My feet at the end of the day don't seem to be as tired as they used to be. I'm glad I tried them. I have recommended them to several other people and friends. Thanks for the help. I work in construction. Feathersprings have taken away the pains. It is almost 1 year since I received my Featherspring inserts – I am very happy with them. I work in construction and the "springs" have taken away the pains I used to get in my feet and calves from walking and standing on concrete and asphalt all day. They did take some getting used to. You supplied the proper timing factor in the directions. Please send a complete brochure on Featherspring inserts to my friend. I would like to have a 2nd set of "Springs" for myself. I would like to have another set because I want never to be without your fine product. They have enabled me to enjoy hiking and skiing all day long. I wanted to tell you how much I LOVE YOUR ARCH SUPPORTS, and admit this is probably long overdue. When I first started college, I was doing a lot of walking and my arches were hurting. I was skeptical when my Father saw your ad in a magazine, but I agreed to try them. I remember within the first few hours, I felt immediate relief and could walk forever! I love them! And that was 10 years ago! I have been using my arch supports in all my footwear since then including shoes, sneakers, hiking boots, cross-country and downhill ski boots, and roller and ice skates. They have enabled me to enjoy hiking and skiing all day long. When selling hiking boots, I have also recommended them to customers (and friends!) when they tell me about their foot problems. I think your supports are absolutely great! I am an extremely satisfied customer! Thank you for such an excellent arch support, service and guarantee! I can walk 18 holes of golf with no pain. Before using Feathersrprings, I would try to walk our Indian Hills Golf Course, but after about 5 holes the ball of my left foot would be hurting so bad I would have to quit. Even the first time I tried my new Feathersprings I have been able to easily walk 18 holes of golf without pain or difficulty. my doctor noticed my walking improved I am so pleased that I found this product, I can't walk without pain unless I am wearing the supports. Yesterday I gave your pamphlet to my doctor, he has noticed that my walking has improved greatly and I told him of your supports. Once again thanks for a wonder product.